The exhibition opening takes place on Friday, November 21st and starts at 7 PM. Feel free to join us and check out the Facebook event for more information. Stuttgart-based artist Jeroo began painting graffiti at the age of twelve. Working without a mentor, Jeroo learned everything he could about spray-painting by himself. This allowed him to develop a fresh, distinct style, which is mainly characterized by combining Graffiti with influences like Art Nouveau. After fifteen years of writing graffiti, Jeroo started creating characters on canvas. Using spray cans, he began to incorporate concrete shapes into his work, developing a special technique of taping to create exact angles and shapes. The result is a mesmerizing hybrid vision where fantastic creatures emerge from a world of letters. “New Frontiers” features works that reveal Jeroo’s dedication to his self-taught craft, displaying a singular sense of personal aesthetic as expressed through unusual perspectives. 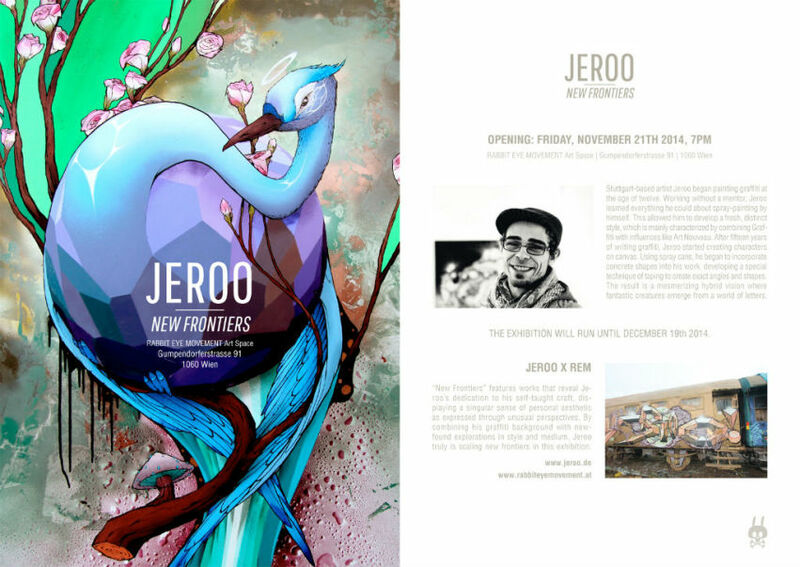 By combining his graffiti background with newfound explorations in style and medium, Jeroo truly is scaling new frontiers in this exhibition. and visit our web shop to get one of the few Jeroo screen prints we have in here!